There are 620+ field IOIs nationwide. There were 139,000+ Federal Firearm Licensees (FFLs) in 2015. ATF conducted 8,696 Compliance Inspection in Fiscal Year 2015. 3,848 inspections had no violations. 1,162 inspections had a report of violations. 1,021 inspections received a warning letter. 444 inspections received a warning conference. 46 inspections resulted in license revocations being sought. 2,175 inspections resulted in other results, such as out of business. ATF conducted 10,981 firearms application inspections. 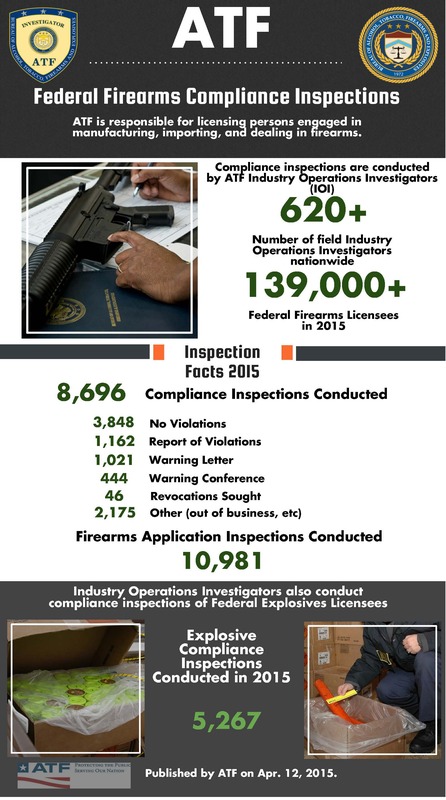 In fiscal year 2015, ATF conducted 5,267 explosive compliance inspections.